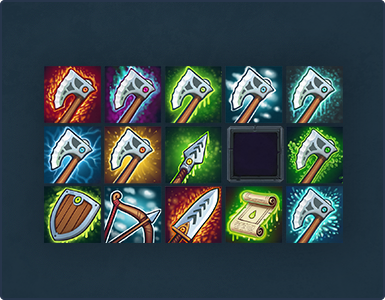 This pack contains 54 icons - 6 item types with 9 different backgrounds representing each of the four basic elements plus cold, acid, lightning, death and life. Available sizes: 64x64 and 128x128 plus I've added 256x256 sources. 6 items x 9 backgrounds = 54 icons. They're not just copy-pasted, each has been hand-painted to fit nicely into the base background :) That's also the reason why I can't separate items and backgrounds - the backgrounds just wouldn't work without the extra painting effort. As usual everything you see has been painted by hand. PS. Sources are not meant to be used in-game, but rather allow you to scale down to any size you wish without losing quality. This is just a guideline, ofcourse you're free to use them however you like!